In honor of its 125th anniversary, Belmont University has dedicated the 2015-16 school year to a campus and community-wide celebration of the institution’s “belief in something greater.” With a year-long birthday party planned, the celebration features many events including an invitation to bring StoryCorps to campus, America’s “oral history project” aimed at capturing some of the country’s most powerful stories. When the initial ideas for Belmont’s 125th anniversary were created, faculty and staff were invited to consider ways to incorporate the celebration into the academic year. Senior Director of University Marketing and Public Relations and 125 Committee Chair John Carney said it was those conversations that laid the groundwork for the University’s year-long programming. As discussions occurred surrounding ways to best celebrate such a significant milestone, Carney said it became more and more clear that the stories of those who contributed to the University’s success should be central to the celebration of its legacy. When creating her 125 celebration proposal, Associate Provost of Assessment and Institutional Research Tracy Rokas said she was struck with the idea of narrative and its centrality to the formation of identity. As a member of the University’s Provost Office, Rokas said her team was looking for innovative ways to infuse campus-wide curriculum with opportunities for students to explore their own compelling narratives. When considering the fit for the 125th celebration and a curriculum emphasis on narrative, Rokas said StoryCorps was a perfect fit. For Carney and the 125 Committee, the idea was an immediate hit. 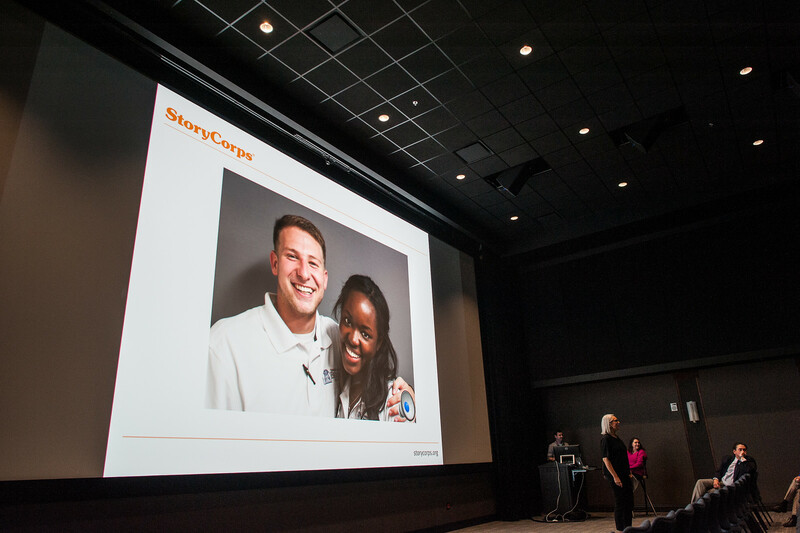 “From the moment Tracy suggested StoryCorps, we knew it had to be a part of the celebration plan,” Carney said. After spending three days on campus in August, the StoryCorps team completed 17 interviews with 34 people from the greater Belmont community including current students, alumni, faculty, staff, trustees, friends and donors. 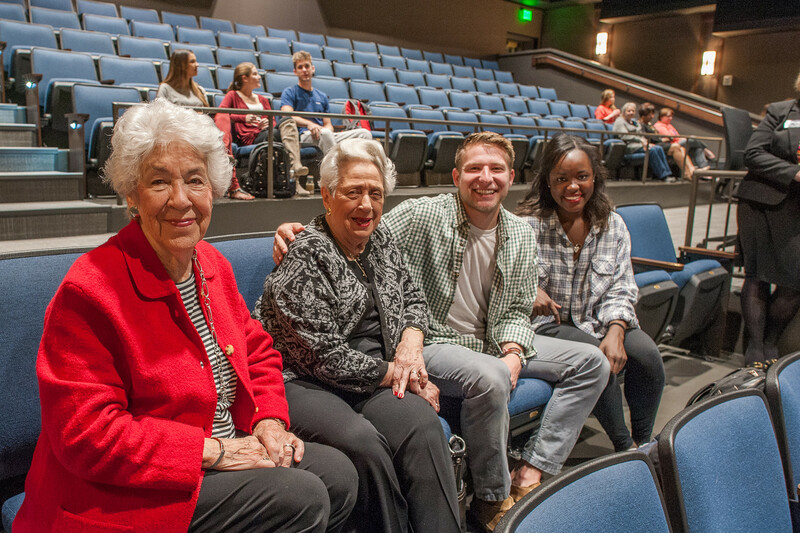 Sitting in groups of two, members of the Belmont family told their stories – the Belmont story – detailing the rich history of an institution that endured significant challenges to become the University known today. To debut the StoryCorps compilations, two interviews with alumni and current students were showcased at a convocation held on Wed., Oct. 21 where StoryCorps’s Eve Claxton discussed the power of capturing history through story. During her presentation, Claxton described the neuroscience behind storytelling versus information processing. When a story is involved, Claxton said the brain processes the information as if the experience actually happened to the listener, a process called neurocoupling. When information processing includes a vivid story, “their stories become your memories,” Claxton said. Current students Mikaela Clark and Zach Middleton shared similar sentiments in their discussion of the Belmont they celebrate today. Though different in size and footprint, its heart has remained remarkably similar to the one described by Niederhauser and her Ward Belmont sister, Neil. To access Belmont’s 125th stories, visit the anniversary website or download “Stories of Belmont” from the iTunes store. To chronicle your own 125 story and contribute to Belmont’s celebration, click here.